After your home has been successfully booked by vacation rental guests, the next step is likely a series of message exchanges finalizing the logistics of their arrival. Many guests will request a certain arrival time, which can be highly variable. Some guests may want to check-in early in the morning so they have an extra day of exploration or some may need to check-in at midnight due to their late flight arrival. In either case, being present to receive your guests versus leaving them a key is something that depends on a number of factors. Of course, it is generally more ideal to greet your guests in person, but that all depends on your availability and willingness to deal with this small hassle. 1. Your home has a unique feature. If your home or rental space has any “unique” features, for example keyless entry, is situated on a steep hill, a security system, or it is a guesthouse in the backyard with private entrance, then it might be a good idea to meet your guests in person and introduce them to these nuances. This will protect your property from accidental misuse and will make it more convenient for you and your guests. 2. Your guests may be “spooked” if they arrive at your home at night. If your home is located in a neighborhood that can be sketchy or in a remote location such as in the woods, your guests may feel uneasy upon arrival, especially in the evening. You can put them at ease by greeting them on site and offering reassurance. 3. This is your guest’s first time renting online. If your guest is a newbie at renting a home online, they will greatly appreciate you welcoming them in person. By showing them the nuances of your property and showing them things like where the washing machine is located, where to find extra linens and paper towels, and which remote controls to use for which devices, you will save your guests a lot of time and trial-and-error. This will give them a more seamless experience and they are more likely to become repeat customers. 4. You’re wary of who your guests are. You may be concerned about whether your guests will match their online profiles in person. 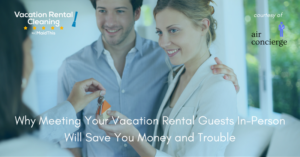 You want to make sure that there are no extra guests that are unaccounted for in the booking and that your guests are not planning on holding a bachelor party or birthday bash on your property. If you want peace-of-mind regarding these issues, it’s best to help your guests check-in in person. If they are bringing a pet, you may want to see that it is indeed well trained and quiet, so as not to surprise the neighbors. Generally speaking, guests who have met the homeowner in person are more likely to take better care of the property. 5. You have hosted this guest previously. If the guests have previously rented your home before, it’s safe to assume you all had a good experience last time. You may have gotten to know each other on a more personal level. Thus, it would be wonderful to welcome them like old friends and present them with a welcome gift. 6. Thank your guests with a welcome package! If you’re meeting your guests in person, you can take the opportunity to go above and beyond: give your guests a welcome gift. Your guests will be so impressed and pleasantly surprised at your hospitality that they will give you glowing reviews and bring you more business. Welcome gifts don’t have to be expensive. They can be things that are useful to the guests, such as travel size shampoo, conditioners, coffee, laundry detergent, and so on. The more you do for your guests, the more you will get in return in the form of an unbeatable reputation and credibility. The more positive reviews you get (and in this day and age, anything less than five stars and people will look elsewhere), the better your business will be. So with this small gesture, you can watch your profits soar. As a vacation rental property owner, meeting Airbnb guests in-person is an important part of the process. How much you want to contribute in that role is up to you. However, keep in mind that the more you offer for your guests, the more you will get in return that will help your business in the long run. A positive review and good online credibility goes a long way in this age of social media. Air Concierge is a California-based vacation rental management company specializing in handling every aspect of your vacation rental – from optimizing your listing to interacting with your guests and overseeing turnover cleanings after guests depart.